Under The Never Sky was one of my favorite 2012 debuts, so my expectations of Through the Ever Night were pretty high. I'm happy to write that TtEN is a worthy sequel of UtNS. Veronica Rossi did a great job in keeping us on our toes and bringing in new surprising information, toying with our hearts (yes I've shed a few tears here and there), as well as successfully avoiding the dreaded sophomore curse that seems to plague some series. The characters in TtEN were as good, and I loved that we got to see more of Roar, especially since I read the Roar & Liv novella before beginning this novel. 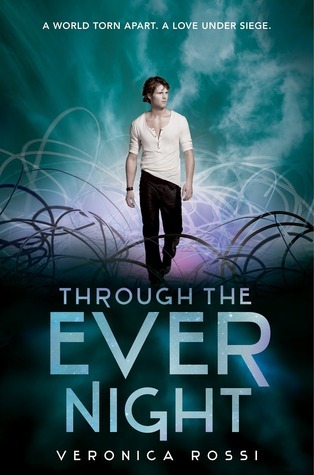 Through the Ever Night had its own plot and I enjoyed it completely. Yes, there is less romance between Aria and Perry, but thats the reality of things. Aria is out searching for the Still Blue while Perry has to take the role of Blood Lord and try to keep his clan from dying of starvation. Character wise, I got to know so much more about Perry, his past, as well as Aria. Since it is told from both of their POVs, we delve even deeper in their thoughts, their insecurities, as well as feelings towards each other. I appreciated the bond Perry developed with Reef, as well as The Six. Also Cinder has become such an endearing character, I would love to see more of him in the third installment. Aria's relationship with Roar is such a sweet one. No, there is no love triangle in this series, but their friendship grew stronger in TtEN and I loved witnessing that. Also a character that surprised me was Soren, the boy who almost choked Aria to death in UtNS. Veronica Rossi knows how to change our hearts and create life in her characters and the connection that all readers look for in characters. Plot wise, the momentum from UtNS did not stop or even slow down. We dive right into the story, with its multiple problems, and race against time and the Aethars to find the Still Blue as well as rescue Perry's nephew and sister. Aria and Perry don't spend much time together in this novel but I actually preferred that because this way we were able to cover more plot and progress faster. Many of the problems got solved or ended in the worst case scenario and the realistic approach in this is refreshing. TtEN is the reason why I love Dystopians so much and I would honestly recommend all dystopian lovers who haven't started this series to do so immediately. Yay I ordered this last night so in a bout two weeks I should be able to get my fix! I'm glad o hear his one is a worthy sequel. Yes! I agree with a lot of your review, especially about Perry and Aria being apart. Even though most of my favourite scenes were when the two were together, I loved that things were still interesting and emotional when they weren't. Great review, Juhina! I am really excited for this one. Glad you enjoyed it too. Great review. I am ready for more Perry that's for sure. Fabulous review! I completely agree with everything you said. This book never slowed down and I was so hooked. I loved seeing all the outside relationships start to develop such as Aria's and Roar's. They were so cute together. And while I might have liked more Perry and Aria time, what they had was enough to tide me over and I look forward to the third book! Awesome review...I think you touched upon everything I personally loved about this book. Sure, I could've used a little more alone time for Aria and Perry, but such is life. It meant more to the story that they were separated and had to find their way back to each other. I am sooo ready for Into the Still Blue! I really enjoyed this one too - maybe even a little more than Under the Never Sky - it felt even darker and I love how Veronica Rossi reveals the world gradually! I loved Under the Never Sky. I'm so glad to see that you loved this one! I can't wait to read it. I think I'm probably the only person on this planet who hasn't read Under the Never Sky yet and I HATE MYSELF FOR THAT!!! Gahhhh...I can't wait to finally read it and find out for myself just how awesome this series is. *fingers crossed* I get to it soon and meet these amazing characters! :) Glad you enjoyed this!